Ireland professional and international rugby player, Jack Conan, has joined up with Volkswagen Commercial Vehicles in 2019 as brand ambassador for their award-winning pick-up, the Volkswagen Amarok V6, writes Trish Whelan. The Amarok V6 is a class leading 4x4 pick-up utility vehicle that has won numerous awards and currently holds the international best pick-up award. Commenting on the partnership, Conan said: "I'm delighted to join with Volkswagen Commercial Vehicles acting as brand ambassador for the Amarok V6. I've just taken delivery of my special edition Amarok V6 Aventura which is simply stunning, from the exceptional build quality and design to the V6 workhorse that provides 272bhp, it is a real pleasure to drive and works as a great lifestyle vehicle choice for me." The Amarok is available in Comfortline, Highline and special edition Aventura trims. The Aventura special edition is packed with a lot more extras than the top of the range Highline model and crucially comes with the spine tingling 272bhp / 580Nm 3.0 TDi V6 engine. The Amarok range starts from €31,494 ex VAT or from €329 per month on either a Volkswagen Financial Services HP, PCP or lease agreement. Commenting on the partnership, Alan Bateson, Managing Director, Volkswagen Commercial Vehicles said: "As Volkswagen is the official car partner to the IRFU, it is great to further that relationship by getting Jack on board as a brand ambassador for Amarok V6. Jack is a world class player and he now represents a world class product in Amarok. "In 2018, Amarok was the fastest growing model in the Irish pick-up segment and 2019 has started the same with huge demand for this exceptional vehicle. Jack has a long-standing link to the building and construction industry which is father was involved in and with the Amarok V6 being particularly popular with this segment in Ireland, it strengthens the partnership even further." Prices start from €31,494 ex VAT and a 24-hour test drive is available at Volkswagen Commercial Vehicle retailers. 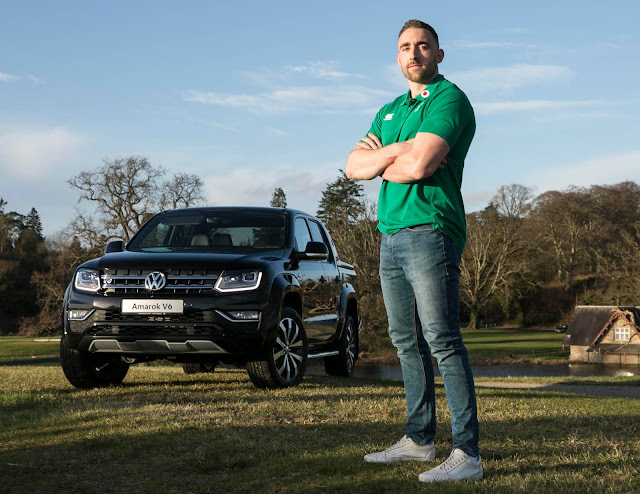 Jack is pictured above with his new 2019 Volkswagen Amarok V6 Aventura, at the Irish rugby team training camp at Carton House, Maynooth, Co Kildare.